About a year ago I wanted to give Wendell his own little corner of the living room. I built him a new dog bed and wanted to put a little something on the wall to make him feel at home. I found a taxidermist on eBay who sells these little stuffed squirrels holding machine guns or wearing tiny versions of those hats with beer can holders. I asked him if he could make me a simple trophy head, given our dog's reputation as the mighty neighborhood squirrel hunter. He agreed and sold it to me for $18. That was all fine and good until a few weeks ago during the 12th inning of the 163rd game of the Tigers' season, I looked over and saw him gnawing on the stuffed squirrel head. "What a waste of $18 I shouted!" and my wife rolled her eyes. 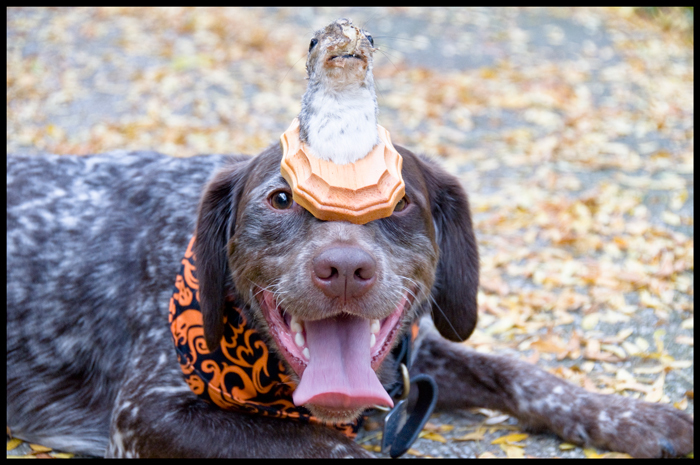 So now Wendell just sits there with it on his head, hoping the squirrels will mistake him for one of their own. So far it has had the opposite effect (I guess it's sort of like a cannibal wearing a necklace of shrunken heads). I need to have a talk with him about hunting strategies (he's a little rusty since his feral days).